We have to try it again. Here’s another shirt,” Jane said as she plucked one of Dad’s blue work shirts out of a plastic bag full of shirts—clean, sprinkled and rolled—all ready to iron. “Start with the yoke,” she directed. I grabbed the damp shirt out of her hand and flopped it onto the ironing board. “I know where to start,” I huffed. I knew to start with the yoke, then iron the collar, then the left sleeve and cuff, front and back, then the right sleeve and cuff, front and back, then the right front, taking particular care around the buttons . . . and with the button hole placket where it was so easy to iron in wrinkles. So begins Carol Bodensteiner’s chapter “Laundry Lessons” in her memoir Growing Up Country, a chapter that describes to a tee the washing, drying, folding, sprinkling, and ironing of laundry, chores that were also observed in the Longenecker family. Mother’s work week was regulated by the pendulum of ritual. Certain tasks were done on certain days in her 1950s household. If it was Monday, she washed clothes, on Tuesday she ironed them, and so on through the week to Friday, the big cleaning day. Her wringer washer and a rinse tub was pulled out to the middle of the “washhouse,” a room next to the kitchen every Monday. Sometimes I helped by feeding clothes from the rinse tub into the washer wringer, a tricky task for a child. At least once I got my arm caught in the wringer. Of course, my screams and yells summoned Mother to fly out of the kitchen, bang on the release apparatus to make the two rollers fly apart. After the fright and the pain subsided, I was amazed my arm wasn’t as flat as a paper doll’s. When I was tall enough to reach the clothes line, I hung up wash clothes, towels, shirts, and dresses, instructed to “hide” underwear in one of the inner lines so neighbors wouldn’t see. 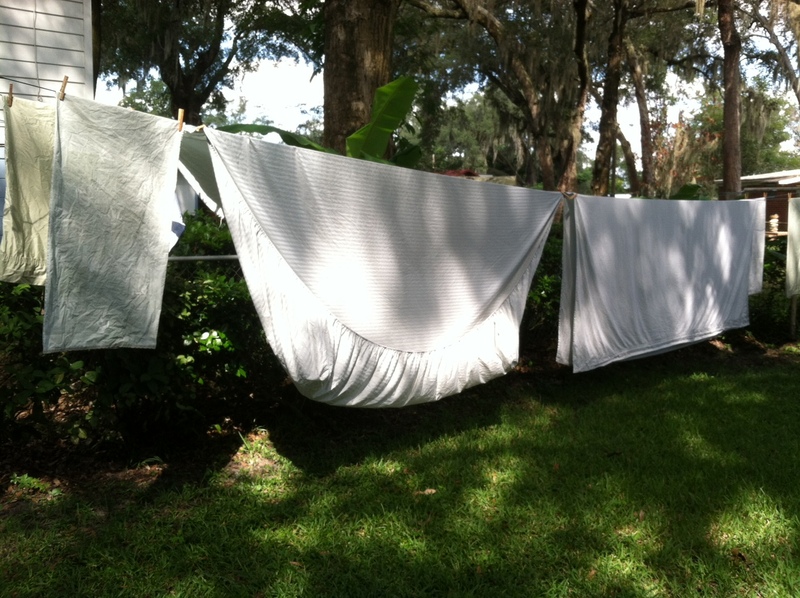 To this day, if there is a sunny day with a breeze in Florida, I hang sheets out to dry. On Tuesdays, Mom pulled the ironing board out of the wall, set up the iron and away I went, attacking first the easy stuff like hankies. I nourished my sense of order and accomplishment letting the point of the heavy, hot iron smooth out all the wrinkles in the garments that followed: school blouses and skirts, finally graduating to Daddy’s white, starched Sunday shirts. We never ironed sheets though one Mennonite woman we knew, Pearl Longenecker, sat down (probably on Tuesdays too) in front of her ironer, a white appliance shaped like a miniature piano, with a hot roller that smoothed each crease in her sheets and pillow cases, pressing them into lovely squares and rectangles to fit her closet space. Grandma Longenecker’s ritual matched our own though it took place on her back porch. Like Colonial American women before her, she made her own soap cooking together grease and lye in a big metal tub, stirring the whole mess as it boiled. 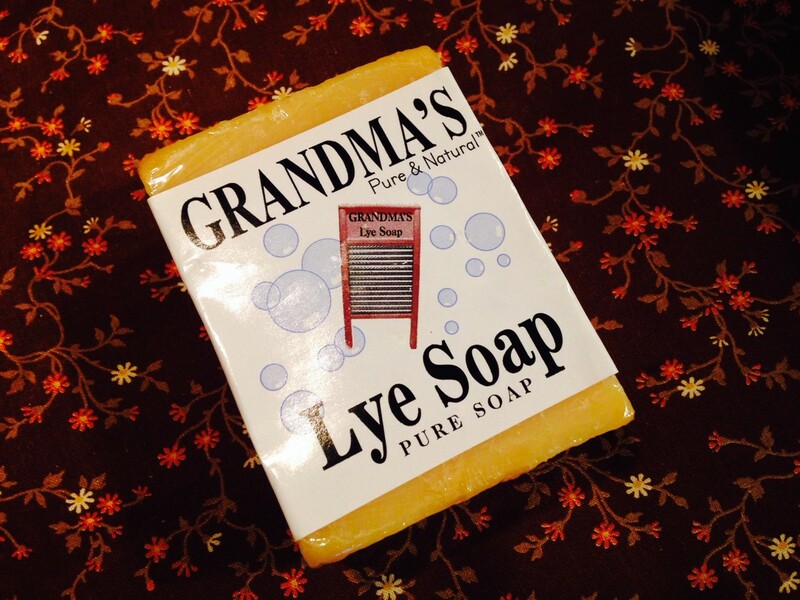 Though the smell was pungent and slightly disagreeable, Grandma smiled as she cut the congealed mixture into squares and rectangles, knowing the grease and grime would be erased from her laundry on wash day. If there were spots that wouldn’t come out with lye soap, she spread the stained garment, usually white, on the grass because she was sure “the sun will draw it out.” And it usually did! Share your laundry rituals, past or present. Something historical–or hysterical! Again, another interesting memory. I also remember washing and ironing. Pearl Longenecker, is that Darlene\’s Mother, let\’s see her husband was Howard? When my Mother was at Mennonite home they came to visit her. It was so nice of them. Yes, Pearl Longenecker is the mother of Reba, Darlene, and Glen. I sounds like they are keeping up the family tradition of kind gestures. Thanks for being first out of the gate to comment today, Shirley. The Monday laundry day often meant a simple dinner because so much time was spent in doing the laundry. (And of course, it took a lot of effort and pots to heat the water long ago.) Was that true for your family? And did your family have the same meal every Monday, Tuesday, etc.? Some of my friends (not Mennonite) have told me that\’s what they had while they were growing up. I\’m curious about the type of washing apparatus your mother had. Or maybe she was lucky enough to send her laundry out. About eating on laundry day – I don\’t remember that we were ever short changed on meals regardless of the day of the week. And I don\’t remember having repetitive menus cycling through the week as you mention the case in some families. My mother liked to cook and we had the typical farm family meal – meat and potatoes with vegetables every day. We didn\’t always have dessert though, but we made up for it on Saturday night when the menu never varied: a box of Breyer\’s ice cream on the table with pretzels and sometimes chips. We loved it of course! When we lived in Dallas–we moved there when I was 3–we had a modern washer and dryer. Similar to the same type people have now, although probably less energy efficient. This was early 1960s. When my mom was first married–during WWII–they didn\’t have a washer. She had to go to the laundromat, and then bring wet clothes and baby home and hang them up from her apartment window. Then later they had a washer, and my dad \”bought her\” a dryer when they moved into a house, probably around when I was born. There was a wringer washer at the place we used to go to in Wildwood during the summer. It was definitely \”old-fashioned\” and a novelty to my sister and me. I remember the drudgery of the laundromat in our first two years as young marrieds. Not just lugging around the clothing but finding enough quarters for the coin-hungry machines. It felt like luxury to buy a house with the washer and drier as perks. You refer to the old-fashioned wringer washer at Wildwood-by-the-Sea as a novelty – ha! I guess it all depends on your point of view. Your comment made me smile too, Judy. Washing on Saturday would have seemed strange to my Mother. It was Monday or nothing for her! And your poor Dad, having to suffer through a hen party. We were not at all rich. 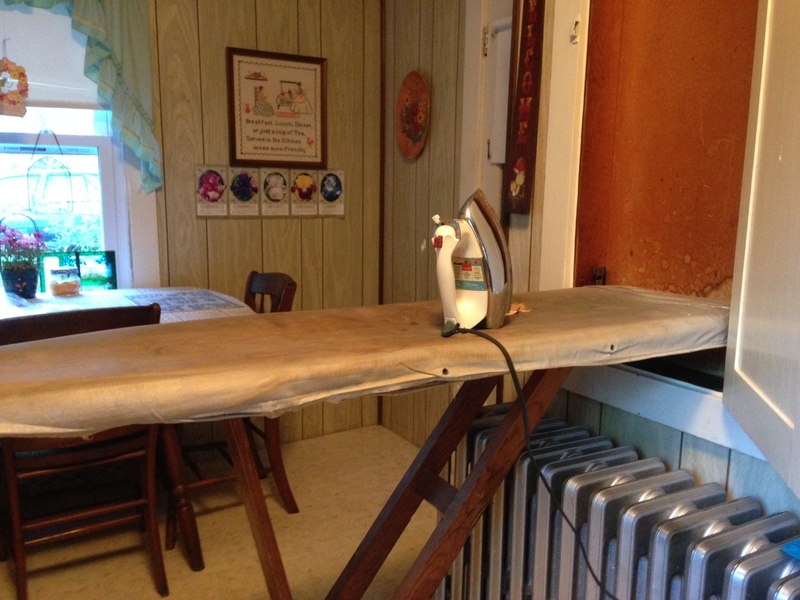 The built-in ironing board came with house when my parents bought it in the 1940s for something like $ 4000.00, more or less. The actual deed is in my mother\’s lock-box at the bank. I heard tell of some who ironed underwear. However, when I saw my son-in-law ironing his T-shirts while at our house, I knew he was a keeper. Great post & pictures! A son-in-law with an iron in his hand! Now that\’s historical, maybe even hysterical. He probably shows his due diligence to his family in other ways now. Thanks, Melodie. A post that has me smiling Marian:). Your posts do take me back – Now I\’m REALLY casting my mind back. In those days when we were little, we had a Nanny who did the washing and ironing. I vaguely remember her .. Miriam was her name. Large, black, warm, cuddly. I\’m sure the wash was on Mondays, the ironing on Tuesdays. I wish I could remember if I was enchanted by hanging laundry out on the line .. all I do know is that there is nothing nicer than towels hung out to dry and crisp; and this is so today. Although fluffing them in the tumble dryer is also nice. Thanks for sharing your warm, rich memories including those of your nanny Miriam. You remind us that the way to appreciate laundry is through the senses: touch and smell. Memories! I learned to iron the same way, starting with dad\’s handkerchiefs on up to dress shirts. When mother couldn\’t get to the ironing right away, she put the damp clothes in the freezer to keep them fresh. Carolle, there was a commenter on Facebook today who said the same thing about her mother putting damp clothes in the freezer. There would certainly not be any problems with mildew in that case. So nice to see you Wednesday evening. I love trading stories. You certainly have a treasure trove of memories, Carolle. Thank you! I think I\’m one of the few of my generation who owned and used a semi-automatic washing machine (SE Asia). You had to wash on one side, wring on the other, and then repeat. All laundry was hung out to dry in the equatorial sun, and you could tell how long ex-pats had lived overseas by the hue of their clothes. Dark, vibrant colors meant you had just stepped off the plane while washed-out, stretched-out clothes signified that you\’d been there a while. I see several books in your future: Certainly one would be tales of the clash (?) of cultures in your years abroad in SE Asia. Interesting anecdote – Thanks, Traci! So much of what you wrote reminds me of my family\’s rituals as I grew up. Our wringer washing machine was in the basement and served us well. Thanks heavens I never got my arm caught in it as you did. I also remember hanging out wash out to dry. Our HOA won\’t let us do that. That\’s a shame. It\’s more energy efficient and I love the smell of clothes as they come right off the line. We probably both have side by side washers and driers . . . time-saving but not necessarily energy efficient. Just outside the laundry room door are 3 parallel clothes lines for sheets and towels if I have the energy and the weather is not too muggy. I agree – there nothing like sheets fresh from flapping in the breeze. Thank you for joining in on the walk down memory lane, Judy. I knew nothing other than a washing machine and dryer. But my grandmother used to love to hang her bed sheets out on the clothesline to dry and washed a lot by hand even though she had a washer and dryer as I was growing up. There\’s just something about the smell of fresh air and sunshine in the clothes when they were brought inside. Welcome, Debby. It sounds like more than \”answers were blowing in the wind\” at your childhood home growing up. I agree, fresh air and sunshine are a nice change from the canned drier smell especially for sheets and towels. Thanks for adding to the conversation. Every comment add something special. Do visit again. As the saying goes – no conflict, no story. At least no gripping story. Yes, about our connecting: the feeling is mutual. This is the go-to site for nostalgia, plain and simple. I post Wednesdays and Saturdays: welcome anytime, Debby. Marian – This was a fun post because it brought back so many memories. I\’d forgotten that we, too, sprinkled our clean laundry, rolled it up, and then pressed it from the never-ending ironing basket! We had a \”mangle\” ironing machine in the garage. My sister and I weren\’t allowed to touch the gigantic, heavy lid, but we were allowed to carefully \”feed\” small flat items in under mom\’s watchful supervision (hankies, dishtowels, pillow cases). Mom took care of the big stuff, including sheets. I\’ll never (ever!) forget when one of mom\’s friends asked if she would iron her hair in the mangle. Mom did it, and we were allowed to watch (under dire threats that if we ever tried it on ourselves or others, we wouldn\’t be able to sit again in this lifetime). I never heard of the ironing machines being called a \”mangle.\” Sounds a little fierce. It would have been interesting to have a camera around when the machine was ironing hair. I assume you and your sister never tried the trick on yourself. But knowing you, I have to wonder . . . . Great story, Laurie! You stir up such memories long forgotten. This sounds so much like the ritual we followed in SE GA. I, being the only daughter, was the laundry queen with my mother supervising during the summer months, other months she had assistance from a part time housekeeper. I was actually happy to see the return of school to get away from \”the laundry.\” As for the ironing, we ironed everything, underwear, sheets, etc. Then this marvelous invention came along, a men\’s work pants stretcher. I\’m not sure, but I think it took just as much time to stretch those work pants over the \”stretcher\” and hang them out to dry than to iron them. Delighted those days are over for us. Thanks for the walk down memory lane. I can surely imagine you the Queen of Laundry, Carolyn. And until you mentioned it, I had forgotten about the men\’s work pants\’ stretcher. I think the frame was made of aluminum as I picture it in my mind\’s eye. Yes, I\’m thankful those days are over and glad for the dawn of the day of permanent press fabrics too. Thanks for adding to conversation with another factoid, Carolyn. I think you have stirred more memories with this BLOG than any other you have written. Do you keep records of posted comments? WordPress keeps records in the form of statistics on my \”dashboard.\” There I can see number of comments and countries from which they originate along with other data. Thanks for noticing, Carolyn. This post brought back so many memories, Marian! The picture could have been my grandmother\’s laundry drying on the line, and my mother always sprinkled the clothes, rolled them and put them in a plastic bag to be ready for ironing. She also kept them in the refrigerator if she wanted to wait a day to do the ironing. I\’m glad you could relate to many details in this post, Marylin. I\’ve learned so much from yours and previous comments. That\’s what I love about blogging: commenters always prompt other memories, like \”iron sharpening iron.\” Thanks for adding to the conversation. Like you, responses always fuel my writing. Thank you. We were never allowed to get near the wringer washer by my grandma. We had a washer and dryer also but when she decided to do the laundry, it was the wringer. One of my aunts, with 11children, used a mangle too, though that was not anytime recent. In fact it\’s out in her enclosed porch/summer kitchen and she puts a seasonal display on it. It\’s actually quite picturesque what with the cast iron curlicues. It\’s painted baby blue now. Ironing was my favorite chore and I did iron sheets and pillowcases and handkerchiefs and some underwear. My father\’s good white shirts were rolled up and put in the vegetable crisper…they made lovely hissing clouds of steam when pressed. 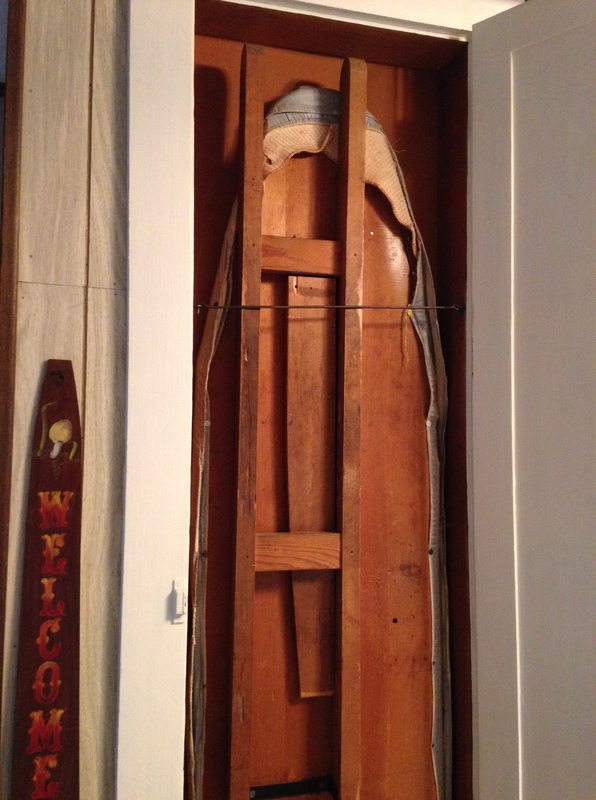 The ironing board was free standing, wooden, made by my grandpa. I still have it though it\’s now out on my summer porch painted lavender and holding flowers and a lamp. We ironed up in our \”TV\” room/sewing room on the second floor. We had a little BW set with rabbit ears. If I could get it to cooperate I\’d watch it otherwise I think I mainly daydreamed a lot. Sometimes I pulled the whole set up out onto the airing porch to enjoy the breeze and the view. I don\’t remember if there was a particular laundry day though I do remember doing much of the ironing on Saturday. Also we never had a specific rotation of meals for a certain day of the week. You are the second person to comment on the mangle, something new to me. I love your description of shirts making \”hissing clouds of steam when pressed.\” Until now I have never thought of ironing as the truly sensory experience it actually is. Like you, I can remember the smell (fragrance?) or items of clothing being whipped into shape. Carol Bodensteiner, whose memoir I quoted from at the beginning of the post, mentioned that her Grandma\’s watched soap operas: As the World Turns, Search for Tomorrow, are forever linked to her childhood memories with the ironing chore. I\’m glad you could connect this task with the airing porch with a breeze and a view, good ingredients for a flight of fancy you call daydreaming. Thanks, Athanasia, for the bit of nostalgia your comment added. My most \”memorable\” washing experience was when I was a boy of thirteen living in Swan Valley, Idaho. Our family was trying to save money so we rented a one-story farmhouse (I never knew there was such a thing). Being a frugal German mother, Mom decided NOT to pay a down payment of $50.00 to turn the electricity on. So here sat an electric wash machine on the back porch, useful only as a container to put soapy water into. From this slosh I would pull out one item at a time and rub the article vigorously against the copper scrub board. After rinsing I would turn the crank to squeeze out the water between the hardened, scarred rubber rollers. I was used to work but this was B O R I N G. After my session was done I had a new appreciation for the early days of laundry before electricity. It sounds like along with the appreciation for an energy-saving appliance came a strong work ethic, probably from your frugal German Mother. Our house was much the same but it\’s funny how every day is wash day now with the advent of automatic washing machines and dryers. You\’re right: Every day is wash day now. The boundaries are blurred in this 24/7 world, which might explain our hectic pace through life nowadays. My, you sure got everybody going. Like the author you are, you have a knack for the perfect words – verbs and otherwise: \”blotch them,\” \”roll into a sausage,\” \”hatching the same white fuzz\” all bring back images of ironing days. You added the right zap to our conversation, Shirley. Thanks! This reminds me of laundry day at my grandmother\’s house in the country. She had to pump her water from the well in the yard and then heat it. They didn\’t have the luxury of changing clothes like we do now. I also remember learning how to press my dad\’s shirts. I was good at it and didn\’t mind the job. Today, I feel grateful for my washing machine and the clothing I never iron. Thanks for taking me back to those hard labor days. My grandma didn\’t have to lift weights for exercise. Our ancestors would laugh themselves silly at women in fitness centers nation-wide who lift weights. They\’d lift the milking buckets, tote the feed for lifestock, carry the egg baskets, the wash baskets, and on and on! What a treat to read your post on laundry, Marian. You and I could have grown up in the same house. My aunt had a \”mangle,\” as I believe Pearl Longnecker\’s piano-shaped iron was called. She also ironed her sheets. And the mangle made short work of ironing trousers, too. I\’m glad my ironing memories triggered yours and your post triggered so many memories among your readers. What fun! I\’m glad you found your way to this post, which your memoir inspired. Now I learned that the ironer was called a mangle, the sound of which seems antithetical to the smoothly pressed garments and linens that proceeded from its steamy arms. Thank you for commenting, Carol.